How to setup internet access (Webaccess) to USB attached Hard disk on Buffalo Router (User-Friendly firmware)? - Details of an answer | Buffalo Inc.
How to setup internet access (Webaccess) to USB attached Hard disk on Buffalo Router (User-Friendly firmware)? WebAccess feature in Buffalo router provides a secured mechanism to access files and data on attached USB hard disk from internet through a WEB Browser. 1- Power and connect USB disk to USB port on the AirStation . 2- AirStation by default will mount the entire USB Disk volume automatically and will set access limit on the entire disk volume. If you want to limit access to certain directories as opposed to the disk volume , follow instruction bellow. Other wise skip to step 3. 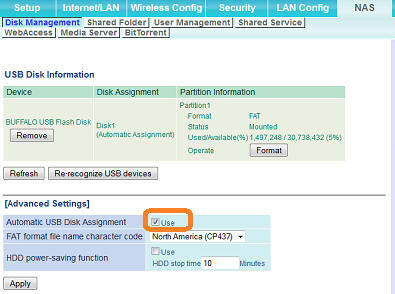 Navigate to NAS -> Disk Management tab and uncheck "Automatic USB Disk Assignment"
Next, Click "Refresh" or "Re-recognize USB devices" . 4- Register an user for the Access Limits. 5- Navigate to NAS -> Shared Folder. 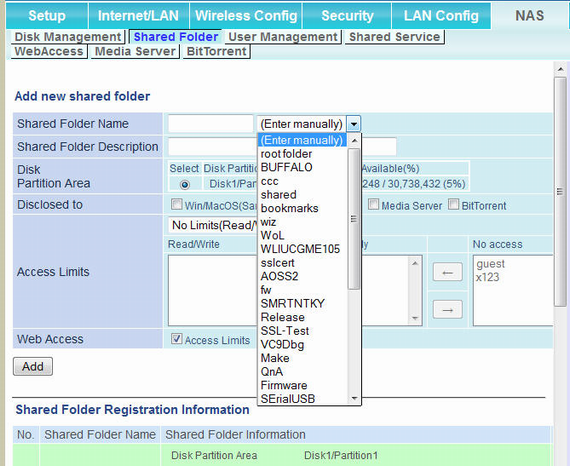 From drop down list select the "Shared Folder Name" that will be accessible to assigned users. Under Access limit, No Limits to "limits" to control access. Select user from right most column/box "No Access" and move to middle column/box for "Read-only" access or move to far left for "read-Write" access. 6- under Disclosed to, Enable Webacess check box option for the shared folder you have selected. To access the shared folder from Internet or Browser based application check/enable "Web Access"
To share with PC and MAC (or Samba) clients check/enable "Win/MacOS(Samba)" box . Click Add Button to commit the changes. A) Check [Enable] for [Web Access]. go Buffalonas.com and re-enter your unique name and key specified in this page. Buffalonas.com will redirect to your router address from internet. Some ISPs (in Singapore for example) setup IP proxy which older firmware unable to handle correctly. 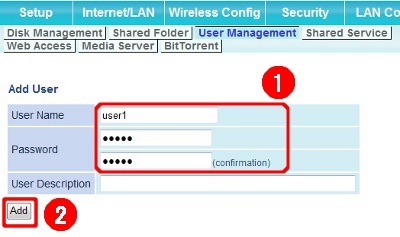 To work around this issue: Select "Use DDNS setting host name .." from drop down menu. 8- Finally, Click [Apply] button to complete Webaccess setup. Thank you for your cooperation in the questionnaire. Please tell us how we can make this answer more useful. c 2012, BUFFALO Inc. All Rights Reserved.